Salesforce is the market leader in the customer relationship management (CRM) software industry, but it still lags behind most of its competitors in one major area: overseas sales. 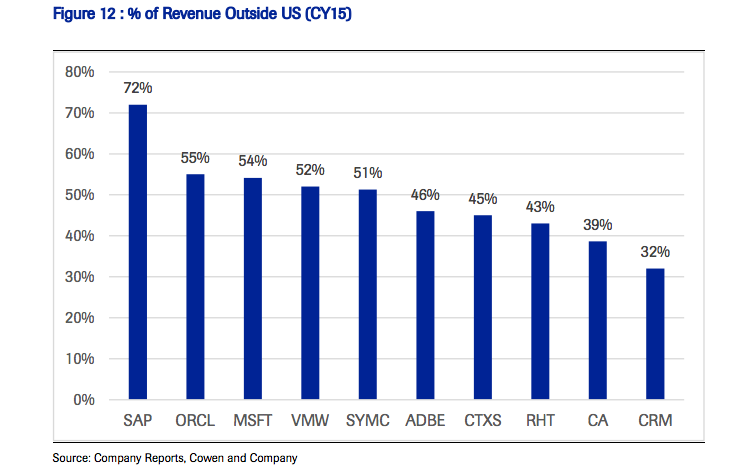 Market research firm Cowen & Co. pointed out in a note published Thursday that Salesforce generates a substantially lower percentage of revenue from international regions compared to other software makers. 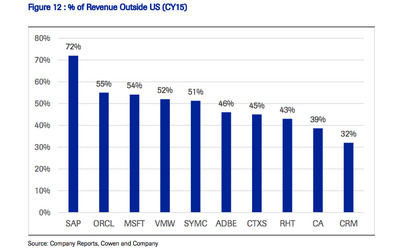 As seen in the the chart below, Salesforce only gets 32% of its revenue from outside the US, lagging behind SAP, Oracle, and Microsoft, which all generate over half of their sales from overseas. A lot of this may have to do with international companies still being reluctant to store their data in the cloud. Salesforce, unlike other competitors, only offers cloud-based software. There are also concerns around storing data outside their countries. To solve those issues, Salesforce has made significant investments in the European region, building its first-ever EU-based data center in the UK in 2014. It’s also opened new data centres in France and Germany over the past couple years, while announcing a new partnership deal to use AWS’s infrastructure for parts of its European services. These efforts are finally starting to bear fruit. According to Salesforce’s most recent earnings, it saw 33% growth in the European and Middle East region, and 27% growth in the Asia Pacific region, both the highest growth rate in 6 quarters. Cowen believes this is all a sign of better things to come. “We wouldn’t be surprised to see international (especially EMEA) to continue to grow at an outsized pace for the foreseeable future, noting that CRM has recently indicated that it is starting to gain greater attention from C -level executives in many regions throughout Europe,” Cowen wrote in the note.